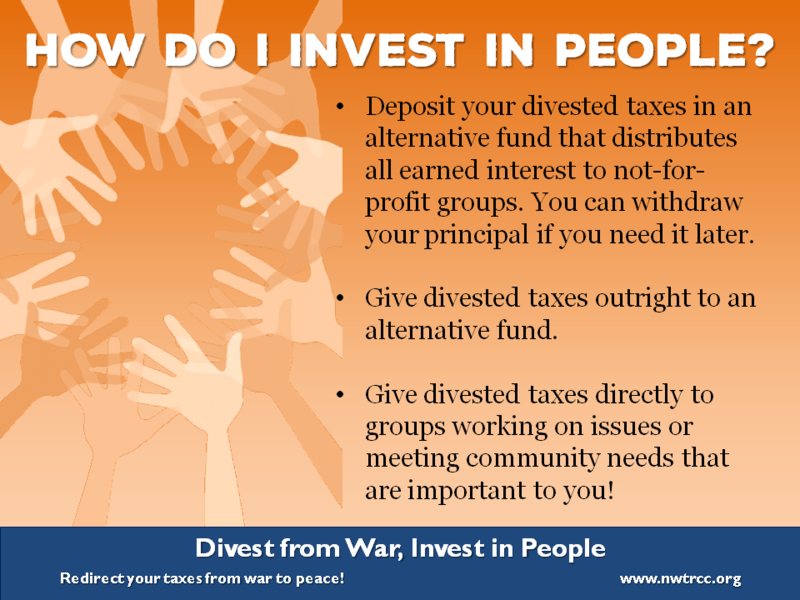 What do we mean by “Divest from war, invest in people”? How much of our taxes are invested in war? 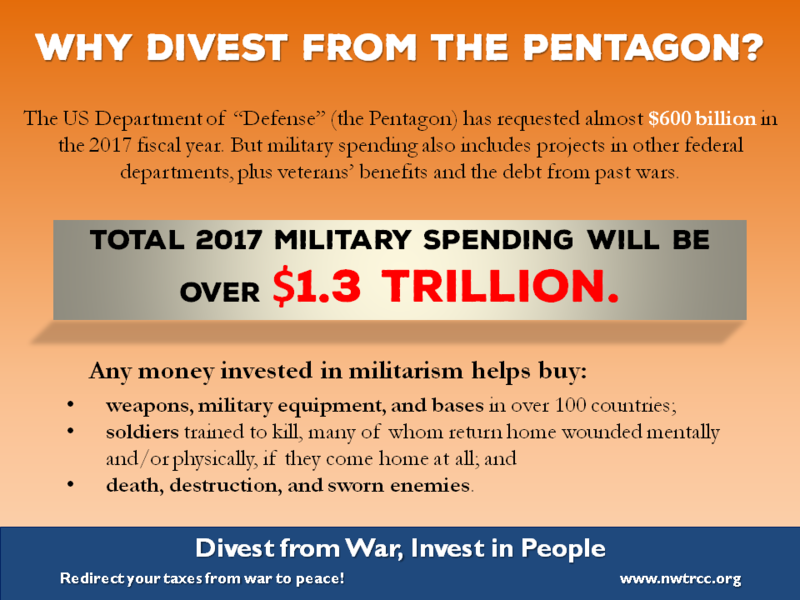 How can we divest from the Pentagon? 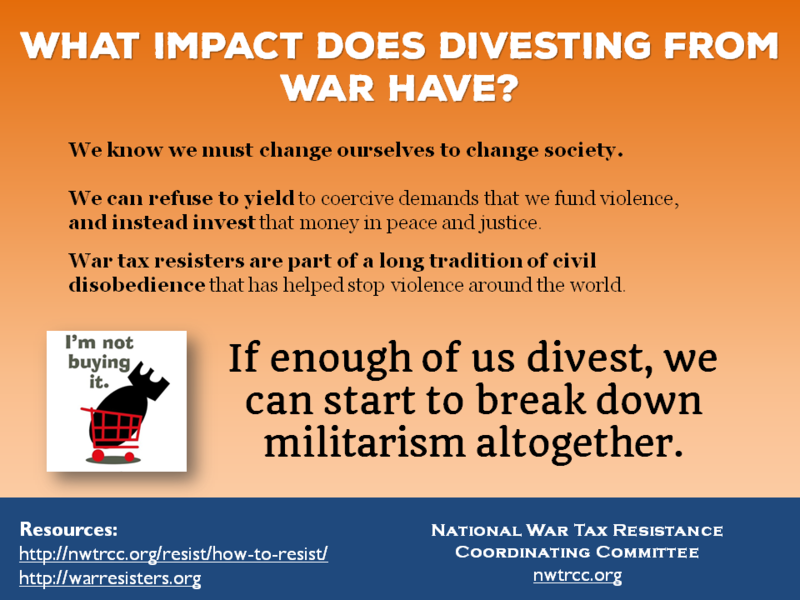 What do war tax resisters reinvest in? Warfare requires soldiers and weapons. But before governments can buy weapons and hire soldiers, they must first raise the necessary money (or borrow it). That’s where taxes come in—most people’s biggest investment in militarism. 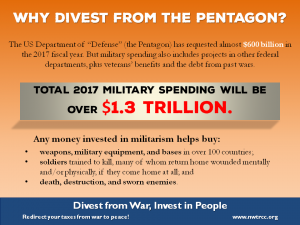 Divestment from war doesn’t just mean selling stocks in the private companies that profit from war. In this era of high-priced weapons systems and international military aid, taxation is the closest war-making link between a national government and most of the people who live within its borders. 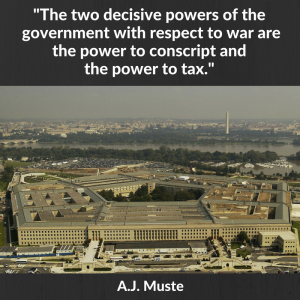 Refusing to pay some or all of the taxes that go to war is a direct way to say “NO!” to over $1 trillion of military and military-related spending every year. And we can also say “NO!” to the militarization of the U.S. federal budget: the wars, occupations, bases around the world, nuclear weapons, foreign military aid and arms sales, and covert CIA violence and torture. 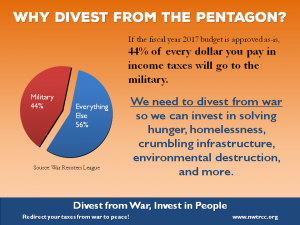 By divesting our taxes from war, we take control over how our money is spent. Many people view paying taxes as a positive investment in social goods, such as infrastructure, social services, and education. Others are critical of taxes as an inefficient or even unethical redistribution of wealth by government. Either way, when most people give tax money to the government, they hope that something good comes out of it. 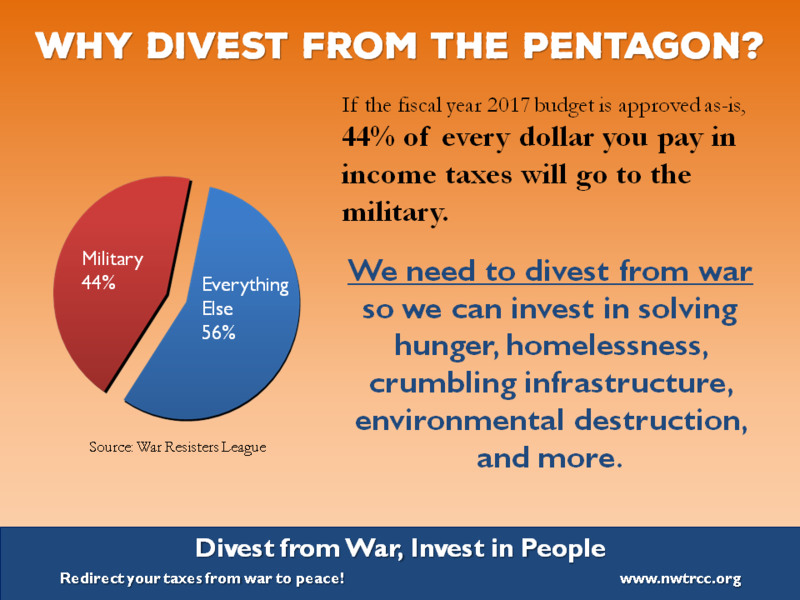 But when we pay income taxes (and some other taxes), we are substantially investing in war and militarism. In the proposed fiscal year 2017 federal budget, 44% of each income tax dollar paid goes to military-related spending. While private contractors make millions, and in some cases, billions of dollars from war, the instigator of war is the government – the Pentagon. We certainly support campaigns to put pressure on private contractors, but taxes are the primary way war is funded. That means we need to put pressure on the government by withholding our investments in war. 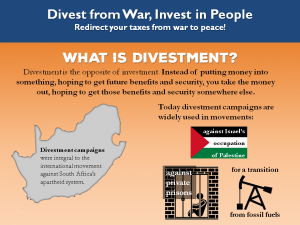 In the divestment campaigns against South Africa’s apartheid system in the 1970s and 1980s, supporters identified companies that did business in South Africa. Then they pressured institutions like banks and universities to divest their pension funds and endowments from those companies. 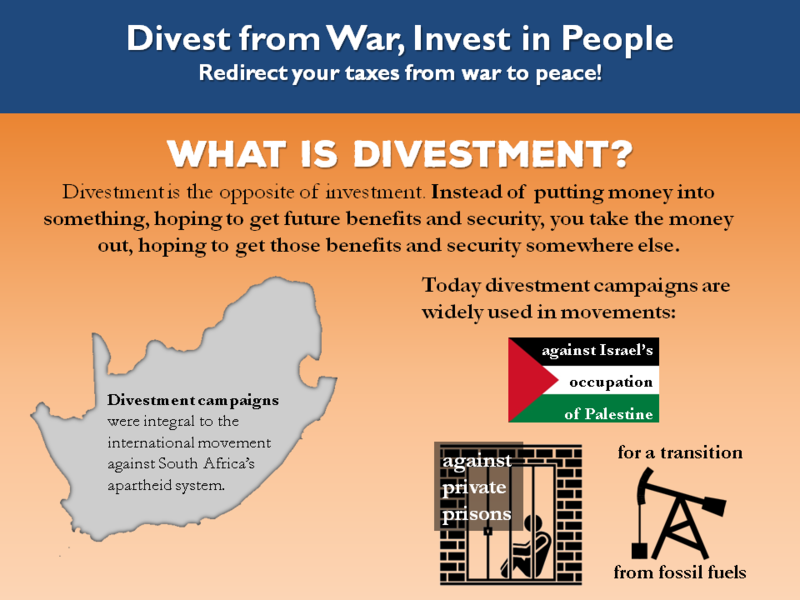 Divestment campaigns are becoming more and more popular, and are currently widely used by movements focusing on getting money away from Israeli occupation, fossil fuels, and private prisons. Fossil fuel divestment campaigns have succeeded in getting several institutions and governments to commit to divestment, to name a few: Stanford University in California, Syracuse University in New York, the city of Berlin in Germany, the city of Copenhagen in Denmark, and Oxford University in the United Kingdom. When we refuse to pay taxes en masse, we can exert the same kind of pressure on the government as divestment causes on companies. Each of these methods has its own pros and cons, risks and benefits. 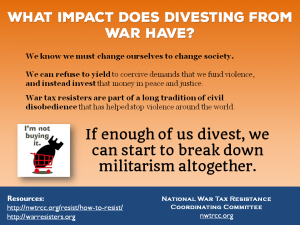 For more information about methods of war tax resistance, see How to Resist. If you owe war taxes and refuse to pay them, you’ll have eliminated a payment to the federal government each year. But war tax resisters don’t refuse so that we can put more money in our pockets. So what do we use this money for? Some resisters set aside tax money in a personal escrow account to await IRS collection. Others pool this money in an escrow account with other resisters – these accounts are called alternative funds. In an alternative fund, deposits may be at lower risk of seizure from the IRS, since all deposits are held in one common account under an organization’s name rather than an individual resister’s name. Some alternative funds only serve as escrow accounts holding money until the government allows taxpayers to pay taxes without any of that money going to war. They may not earn or distribute interest on that money. Other alternative funds distribute the interest from their deposits each year, distributing hundreds or thousands of dollars to non-governmental organizations and groups. 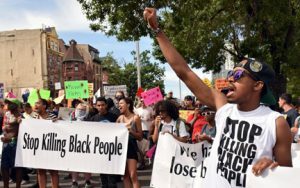 For example, in 2016, the People’s Life Fund in Berkeley redirected $20,000 to 16 community groups. 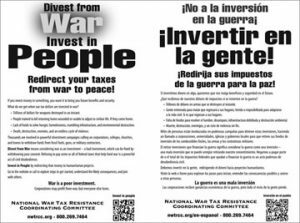 Other alternative funds that make significant redirections each year include the People’s Life Fund in New York City, the Conscience and Military Tax Campaign (whose redirection ceremony is pictured to the left), and New England War Tax Resistance. Jason Rawn (on the left in photo) made 1,000 stickers that read, “Defund Militerrori$m” and distributed them to people around the US and the world. Robin Harper, who popularized the idea of war tax redirection, has tracked his redirections since 1958 on an enormous chart. He has given to the American Friends Service Committee, Greenpeace, Fellowship of Reconciliation, and dozens of other organizations in his 50+ years of redirection. John and Pat Schwiebert of Portland, Oregon, have refused to pay some or all of their federal income tax in protest of military violence for more than 30 years. For many years, they have gone to the offices of the Multnomah County government in person and explained their resistance as they present a check in the amount of their resisted taxes. 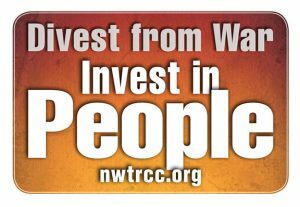 In 2017 NWTRCC is promoting Collective Redirection of tax dollars to resistance organizations led by Black, Brown, and Indigenous People. Get together with other resisters in your community or region, add up your redirected dollars, and select a group or groups in your area to receive the redirection. At the same time work to build relationships to enhance the interconnections between our movements. Click here for more on the 2017 Collective Redirection. Jason Rawn traveled to Okinawa to support US military base resisters, including getting arrested with them as they protested the bases. 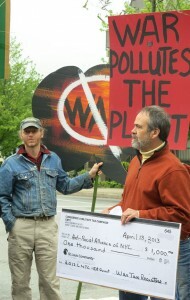 He worked with local organizers to create banners saying, “Dive$t from the Pentagon! No taxes for war!” in Korean, English, and Japanese (as pictured). 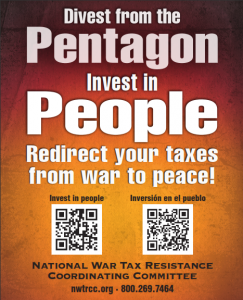 In 2016, San Diego organizer Anne Barron (second from right) put together a Divest from the Pentagon, Invest in People press conference on Tax Day, featuring Southern California War Tax Alternative Fund and its grantees. She also conducted a “teach-in” on war tax resistance using the heading Invest in People, Divest from the Pentagon, using David Gross’ book 99 Tactics of Successful Tax Resistance. 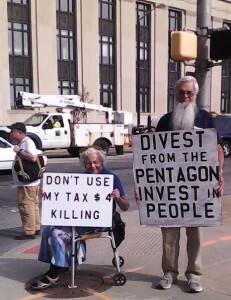 Peter Smith (right) created this Divest from the Pentagon sign for South Bend, Indiana’s annual Tax Day protest. In 2008, the War Tax Boycott campaign initiated by NWTRCC pooled refused war taxes from over 300 resisters and redirected $10,000 to the Direct Aid Iraq, a humanitarian relief and peace-building project, and more than $6,000 to Common Ground Health Clinic in New Orleans, which was providing services to people after Hurricane Katrina. 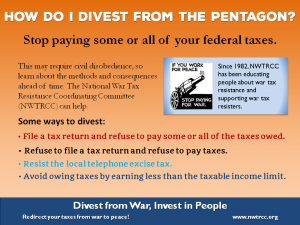 Hold a war tax redirection event themed around divestment and investment. See information about the 2017 Collective Redirection here. Connect with organizers in other divestment movements. As we’ve mentioned, war taxes are definitely connected to Israeli occupation, fossil fuels, and private prisons, for example. Table together or organize an event with speakers from multiple divestment movements. 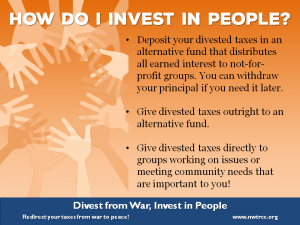 Conduct a “Divest from war, invest in people” event with other antiwar groups in your area. 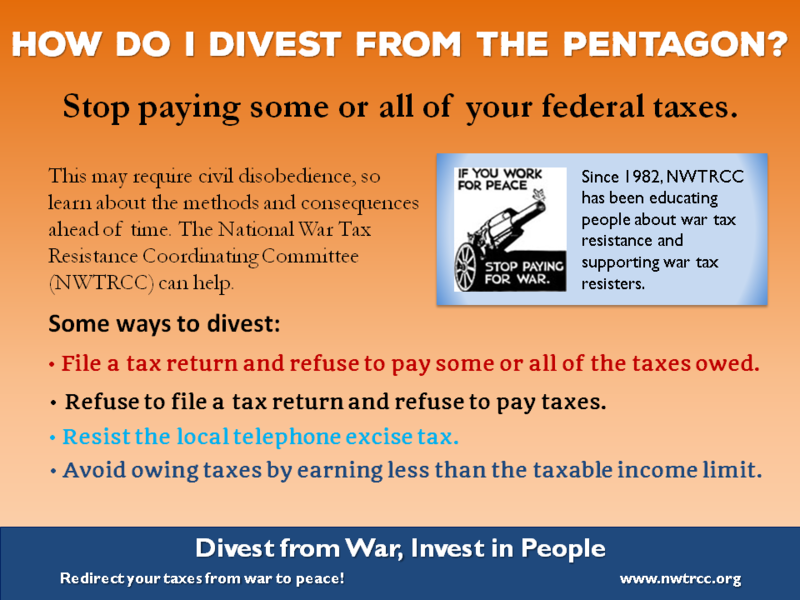 War tax resistance is one tactic among many that can further the peace movement, and not many peace/antiwar activists are aware of it – or aware of the many different ways a person can be a war tax resister. 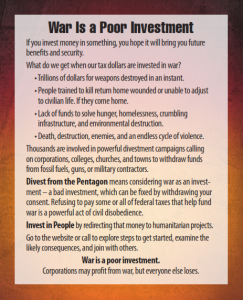 Use our infographic (full text also available at link) to spread the word about war tax divestment online. Use the infographic, in multiple PowerPoint slides or in multiple downloadable image files below, online or in a presentation in your community. Order NWTRCC cards or flyers (see images below) in English or double-sided in English and Spanish by contacting our office. Cards are free to organizers who will use them!